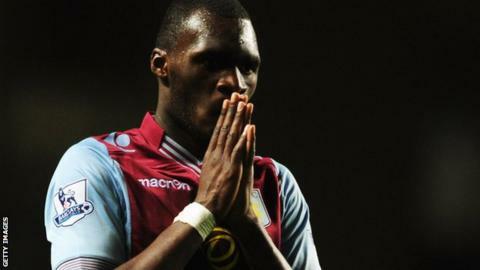 Aston Villa striker Christian Benteke has been ruled out for a minimum of six months with a ruptured Achilles tendon. The 23-year-old Belgium international will have surgery on the injury sustained in training and will miss this summer's World Cup in Brazil. Villa manager Paul Lambert said: "It's a terrible blow both for Christian and for the club. "But he'll work hard because that's what he does and he'll come back for us stronger than ever next season." Benteke joined Villa in August 2012 in a £7m deal from Belgian club Genk. He scored 23 goals in all competitions in his debut season in England and was linked with a move away from Villa Park. Benteke handed in a transfer request last summer, but withdrew it to sign a new four-year contract in July 2013. He has scored 11 goals this season despite going four months without finding the back of the net and was set to be named in the Belgium World Cup squad. Manchester City defender Vincent Kompany, Benteke's international captain offered his support via Twitter. He wrote: "Wishing you all the strength you need Christian Benteke and I hope you will recover quickly! We're all with you together!" Can Benteke save Villa's season? Read more on Can Christian Benteke save Aston Villa's season?